WHY GO TO PARIS IN MID WINTER? Although winter has well and truly settled in for a while, this doesn’t mean that that Paris is quietly slumbering or even slowing down. On the contrary, during the winter months the city is abuzz with fabulous exhibitions, imaginative concert programs and other great things to do, such as the eagerly awaited start of the end-of-winter-sales, which this year kicked off on 09 January. Winter in Paris always offers a dizzying choice of outstanding exhibitions at every possible venue. This is somewhat in contrast to high summer, when so many locals are en vacance, that to maximise attendances, many big, important “blockbuster” shows are scheduled for the colder months—although of course there are always exhibitions and shows on at any time of year. Locals are very much the target audience, with visitors being generally regarded as “icing on the cake” as far as audience numbers go. 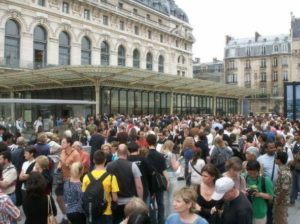 Queues outside Musee d’Orsay–you don’t want to do this in winter! Photo, worldinparis. 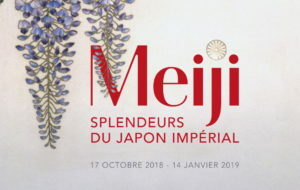 The French are very keen exhibition-goers, so we strongly recommend buying tickets online through the venue’s own website (they all have English language links) before you leave home or least before you get to Paris. At this time of year, no-one relishes the thought of queuing for hours in the hope of securing a ticket to a popular exhibition, and as there are very limited numbers of tickets allocated to on-the-day sales, the earlier you book the better, to avoid missing out—and wasting valuable time freezing outside in a long line of fellow-hopefuls. Paris takes great pride in its cultural institutions and it seems that another new gallery or venue opens somewhere in the city almost every year. 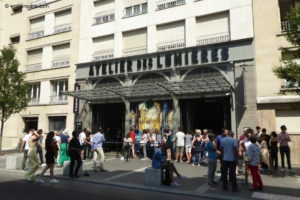 One of the most recent additions has been the Atelier des Lumieres. This is housed in a former iron foundry dating from the early 19th century, and located in the 11th arrondissement. Interestingly, this unprepossessing neighbourhood is enjoying a revival, with small galleries and studios opening. The old foundry has been converted into an incredible digital art centre by the Culturespaces organisation, and from the outset with its first show, focussed on the artist Gustav Klimt, it has drawn huge crowds as word spreads. There are no actual pictures, but rather, the images are projected onto every surface of the space. It’s a dynamic and mesmerising effect, enhanced by a great soundtrack for a totally immersive experience. The run of this show was extended until mid January and has just closed. 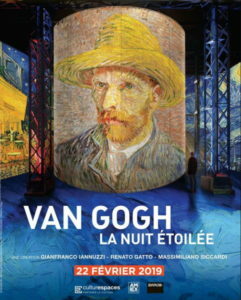 The new exhibition, Van Gogh, Starry Night, opens on 22 February and scheduled to run until 31 December. 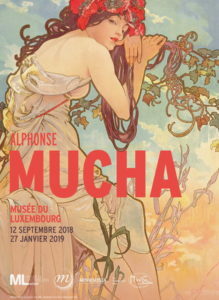 The work of a contemporary of Klimt, Alphonse Mucha, is on show at an important exhibition at the Musée du Luxembourg. Remembered today as the great representative of the Art Nouveau style, Mucha achieved fame with his sinuous posters, notably of the actress Sarah Bernhardt. The exhibition also explores the versatility of this artist: painter, sculptor, photographer, decorator, jewellery designer and valued teacher. The Grand Palais is the venue for the really big blockbuster exhibitions in Paris. This winter, there have been two: Magnificent Venice! 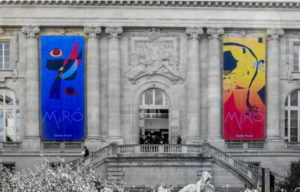 Europe and the Arts in the 18th Century, as well as an exhibition of over 150 works of Miro, tracing the technical stylistic evolution of the artist. Always allow a couple of hours for any show at the Grand Palais, with its many rooms spread over two levels, used to capacity for these special exhibitions, not to mention the big crowds that throng to anything on here. For a change of pace, you could have headed to the beautiful Picasso Museum, the former Hôtel Salé, in the Marais to see a selection of Picasso Masterpieces, which attempted to examine the meaning of “masterpiece” when considering Picasso’s vast output. The show brought together a number of his works that had not been shown in Paris before, loaned from galleries and private collections worldwide. 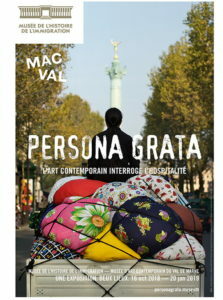 The controversial subject of immigration is addressed in a large exhibition titled Persona Grata at the Musée de l’Histoire de l’Immigration, in the Palais de la Porte Dorée in 12th arrondissement. A classified historical monument, it was built for the Colonial Exposition of 1931, and is a splendid example of the Art Deco style. Its permanent collection is well worth a look. It explores the history of France through the arrival of immigrants in economic development, social evolution and cultural activities. If Gothic art is your passion, head to the recently re-opened Musée Cluny which has a new exhibition, Birth of Gothic Sculpture: Saint-Denis, Paris & Chartres, 1135-1150 on at the moment. As a world centre of fashion, Paris has long been known for its wonderful museums devoted to costume and fashion. 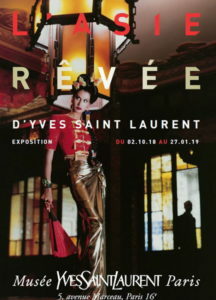 The Musée Yves Saint Laurent’s big show of the season is Yves Saint Laurent: Dreams of the Orient—unmissable for admirers of this genius of fashion. 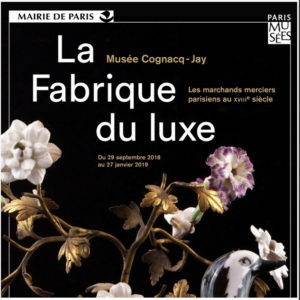 A very popular exhibition this season is at the beautiful Musée Cognacq-Jay in the Haut Marais, titled The Luxury Factory: The Parisian Merchant-Haberdashers in the 18th Century. The museum, the former Hôtel Donon, houses the collection of 18th century art amassed by Ernest Cognacq, founder of La Samaritaine department store and his wife, and offers a unique perspective on the Age of Enlightenment. One of our favourite galleries is the Musée Jacquemart Andre in Bvd. Haussmann in the 8th arr. They have a very special exhibition for the winter season, Caravaggio in Rome, Friends and Foes. The museum itself is spectacular, housed in the former residence of a wealthy banking family, a number of whom were prodigious art collectors. There’s a delightful in-house café that’s highly popular with locals for lunch. There’s a wealth of things to explore if you’re a fan of sculpture. 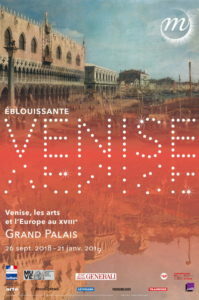 There are two great exhibitions on during the winter. 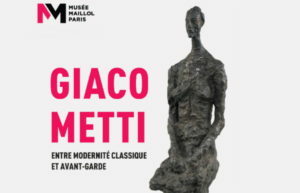 There’s Alberto Giacometti: from Tradition to Avant-Garde at Musée Maillol in the rue de Grenelle in the 7th arr., while the Musée Bourdelle, not far from Montparnasse in the 15th, is showing Masters and Pupils: Rodin, Bourdelle, Giacometti, Richier. 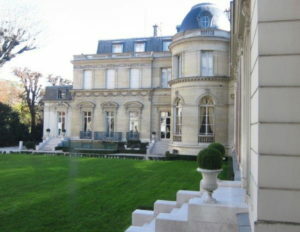 One of the loveliest art museums in Paris is the Musée Marmottan-Monet in the 16th arr. 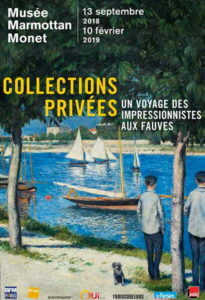 This winter’s special exhibition titled Private Collections: A Journey from the Impressionists to the Fauves, shows over 60 works by Monet, Degas, Renoir, Rodin, Seurat, Signac, Gauguin, Van Gogh, Vlaminck and Matisse, just to name some of the artists. A wonderful opportunity to see important works usually not on public view. The outstanding Institut du Monde Arabe, housed in a landmark building designed by French hot-shot architect Jean Nouvel is in the 5th arr. at the end of Bvd St Germain and opposite Ile St Louis. One of the city’s most important cultural institutions, it holds outstanding shows and events throughout the year. 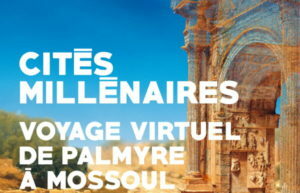 This winter’s major exhibition, in partnership with UNESCO, is Age-Old Cities: A virtual Journey from Palmyra to Mosul, which uses the latest digital techniques to give life to the splendours of four great architectural sites in the Arab world that are threatened or have been destroyed—Mosul, Aleppo, Palmyra and Leptis Magna. This is probably the closest most of us will get to experiencing these dazzling civilisations. As an aside, the top floor outdoor terrace of the Institut offers the best free view of Paris, looking down the Seine to Notre Dame. 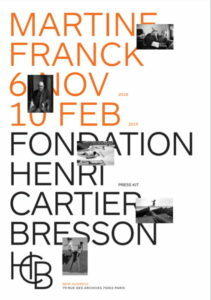 Paris also has great galleries that specialise in photography such as the Maison Européenne de la Photographie, while Fondation Henri Cartier Bresson is showing photographs by Martine Franck. As well, the Bibliotheque Nationale de France has a special photography exhibition this winter, and there’s an excellent free exhibition of photography at the Hotel de Ville called Photographier Paris. The French have long had a long love affair with Asian art, and if this is one of your special interests, head to the Musée Guimet for their winter show, Meiji: Splendours of Imperial Japan, or there’s Treasures of Kyoto: Three Centuries of Creation in Rinpa, at Musée Cernuschi—a most interesting art museum, located in a magnificent hotel particulier next to the Parc Monceau, that specialises in Asian art from China, Japan and Korea. This is just a very brief look at what’s on in Paris this winter. There’s so much to see and do, there’s no time to obsess about the weather! Just head out and enjoy all that the season has to offer.